The iPhone has made daily life much easier in many respects. There's a really good camera in all of our pockets, you can easily connect to friends and family and there a host of services that can save you time or money. But there's also some untapped potential because there's hundreds of millions of iPhones being used everyday. Apple is tapping into this potential to bring medical research into the 21st century with its ResearchKit software platform, which has been around for two years now. In that time, over 100,000 iPhone users have already enrolled in ResearchKit programs on the App Store. It's also been used by more than 50 researchers and developers around the world including the UK, Europe and in Japan. Essentially it's an open source software tool for medical researchers, doctors and scientists to use to help collect data on people suffering from diseases such as Parkinson's and diabetes. They can use ResearchKit to build health monitoring apps for the iPhone that can collect data from both the smartphone and Apple Watch. Patients can opt in by downloading specific research apps from the App Store and completing tasks assigned to them by researchers. Or, more simply, they can allow access to data collected by the Apple Health app. How will it help medical researchers? Researchers have told Wareable how frustrating conducting research is. You usually have to send out hundreds of thousands and letters and hope people volunteer. Or, you have to go around and ask a bunch of people in your local area to participate. You've probably seen those pieces of paper on community bulletin boards that have short rip-off tags that people could take if they were interested. It's kind of like that. But with user-friendly ResearchKit apps, anyone with an iPhone is able to quickly opt into medical studies relating to their health conditions, saving time and money. There are also no geographical limitations, so a study in Boston can use people from Hawaii. 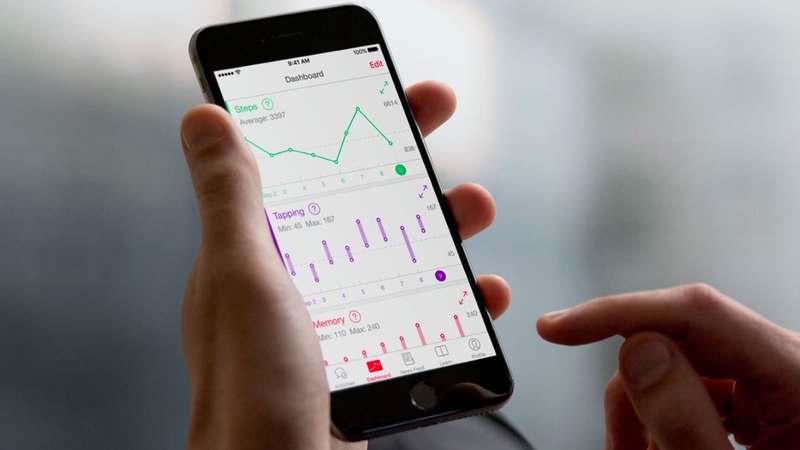 "By using Apple's new ResearchKit framework, we're able to extend participation beyond our local community and capture significantly more data to help us understand how asthma works," said Eric Schadt, Professor of Genomics at the Icahn School of Medicine, Mount Sinai. It also means data collected by the iPhone and Apple Watch sensors can be sent to researchers much more frequently than if patients were required to travel to give samples or perform tests. Data on fitness, speech, memory, gait and motor impairment can be collected up to once every second rather than once every three months. Plus there's less paperwork and admin to deal with. As well as tracking and recording their own heart rate, sleep patterns, activity levels and memory in Apple Health, sufferers of diseases such as breast cancer and asthma can help researchers trying to make breakthroughs in treatment with very little extra effort. It's essentially a chance to help future generations of sufferers without long distances to travel or tiring days performing tests in a lab. Some of the example apps which Apple has already shown off even help sufferers make different lifestyle, food and exercise choices as they continue to input their data. For instance, the GlucoSuccess app developed by Massachusetts General Hospital can help participants with diabetes understand how their food and activity choices affect their glucose levels. It can also help researchers study rare diseases more easily. Like the University of Pennsylvania's Sarcoidosis study. It's a rare disease that doesn't affect too many people, which would make it extremely difficult for researchers to study the disease in the traditional way. ResearchKit allows researchers to get the data they need far quicker than ever before. It also allows them to connect patients to specialists in that disease, which can be absurdly difficult and costly. Which diseases are being targeted first? Here's a rundown of some of the apps and research collaborations that are already taking place. SleepHealth is an app built by IBM Watson and the American Sleep Apnea Association that uses the sensors from the Apple Watch and iPhone to monitor and study sleep quality. The idea is to use this data to see the effects on productivity, alertness and overall health. The Autism & Beyond App takes advantage of the iPhone's front-facing camera to detect the changes in emotion to a child's face when they're watching videos on the smartphone. EpiWatch is one of the first ResearchKit apps that uses the Apple Watch. Built by Johns Hopkins researchers, the app uses data from the built-in heart rate sensor, accelerometer and gyroscope to track measure changes when epileptic seizures take place and analyse possible triggers, medications and side affects. The Icahn School of Medicine at Mount Sinai, together with a company called LifeMap Solutions, have developed the Asthma Health app. The study will track both symptoms and triggers and encourage participants to alter their behaviour and stick to treatment plans. Share the Journey is an app that looks at breast cancer survivors, developed by a number of institutions including UCLA and Penn Medicine. It will use a combination of sensor data from the iPhones and participant surveys to track mood, fatigue, exercise and sleep to try to find out why some breast cancer survivors recover quicker than others. The University of Rochester worked with Sage Bionetworks to build the Parkinson's mPower app. Using memory games, tapping on the iPhone screen, speaking into the microphone and walking, participants can add their sensory data to the study. The researchers are aiming to help people living with the disease by tracking symptoms of Parkinson's. Stanford Medicine has built the final app on the launch list, MyHeart Counts. Researchers will combine data on activity levels with surveys and risk information to study the affect of lifestyle and exercise on heart health. Since then, there have been many more research studies popping up. Two of the more recent ones are Phendo, part of the Citizen Endo research initiative, and the previously mentioned Sarcoidosis app. There's the option for the module to be funded by researchers and there's already a few ResearchKit studies taking advantage of the genetic data. That includes the Asthma Health app, MyHeart Counts app that focuses on cardiovascular health and the PPD Act app that aims to get a better understanding of depression. Nothing is perfect, including a good and noble program like ResearchKit. Misha Rosenbach, a researcher at the University of Pennsylvania working on the Sarcoidosis study, tells Wareable that one of the problems with ResearchKit studies is that they're limited by the people who own iPhones and Apple Watches. Certain diseases, like Sarcoidosis, affect certain demographics and income levels more than others. If afflicted people targeted by a study don't use iPhones or Apple Watches, because Apple products tend to be more expensive than the competition, then researchers run the risk of skewing their studies. It's unclear how Apple could fix this problem, but researchers could work around this by studying other things in regard to the disease. Alternatively, they could opt for third-party - and unofficial - versions of ResearchKit ported to Android. Will Apple look at your data? When Tim Cook and company first announced ResearchKit they assured people that Apple wouldn't collect any of the data generated through the platform. It does however appear to have altered its stance. Two ResearchKit apps, Mole Mapper and the mPower Mobile Parkinson Disease Study appear to have granted Apple access as a secondary researcher. It appears the company hopes to better understand the role the iPhone's sensors are playing to help generate the valuable data. This is possibly to further develop ResearchKit and add new features. For example, at WWDC 2017 Apple added the ability to test attention span, visual attention and range of motion. Apple also revealed to Mashable that it will be listed as researcher for certain ResearchKit studies receiving data from participants who consent to share their data.